The Syrian Orthodox Church of St. Mark is located in northeast corner of the Armenian Quarter of the Old City of Jerusalem—on Ararat Street. This church is said to have been built on the site of the house of Mary, mother of John Mark, to which Peter went after having been released from prison by an angel (Acts 12:12). Syrian Orthodox Christians also believe that this was the site of the Upper Room of the Last Supper, the site of the outpouring of the Holy Spirit on Pentecost, and the place where Mary, the mother of Jesus, was baptized! 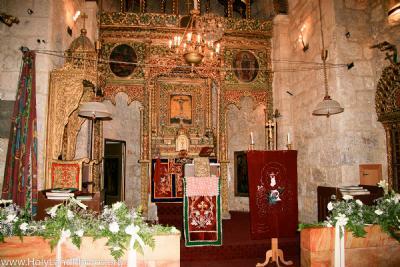 It is also the church where an icon of the Virgin Mary and Child is reverently displayed. This icon is said to have been painted by Luke, the physician/evangelist, and that it is the first icon ever to have been produced. To view a 10 minute video featuring the Archbishop and the Church Click Here.